How Much Topsoil Do You Need Per Acre? What Minerals Are Found in Topsoil? Do I Need Topsoil to Plant New Grass Seed? What Size Pile Is 4 Yards of Topsoil? What Is in Earthgro Topsoil? What Is Topsoil Used For? Many areas have topsoils that are not well balanced for gardening or agriculture. Although there are some ways to abate poor soil without completely replacing the topsoil, the best way to create good, healthy topsoil is to remove the existing topsoil and remix it with the missing soil components. A very important aspect of maintaining your new topsoil's health is to regularly rotate garden crops and regularly fertilize the new soil. Dig 8 to 12 inches of topsoil out of the area to be augmented. Place this soil in a mound. Sift the topsoil to remove rocks and larger objects. Sifting also allows you to establish the overall composition of your existing topsoil. Make a new pile of your sifted soil. Analyze the existing contents of your topsoil. Ideally, topsoil should be about a third sand, a third clay and a third silty soil. Add various components to achieve this approximate mix. A combination of a shovel and a garden rake should allow for good, thorough mixing of the components. Analyze the organic components of your topsoil mix. 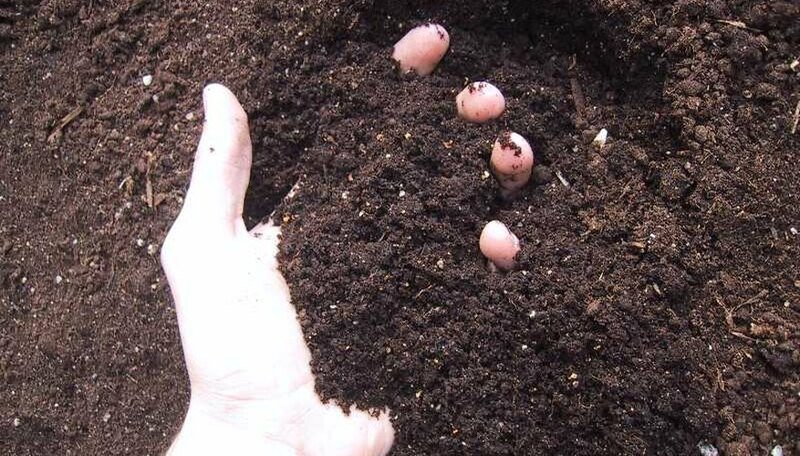 Topsoil for gardening will have around 20 percent to 30 percent organic matter. Add organic fertilizer, like compost or cow manure to achieve a good balance of organic and soil matter. Thoroughly mix the added components with your original sifted soil and shovel it into the area from which you removed the original topsoil. The soil is ready for planting. The amount of topsoil required per acre is 4 to 6 inches; to reach that depth, add approximately 537-to-807 cubic yards of topsoil, respectively. Topsoil is rich in minerals from organic materials that have decayed, including nitrogen, potassium, calcium, sulfur and phosphorous--all critical to plant growth. Determine how much topsoil you need to cover your lawn. Find the total square footage of the lawn by measuring its length and width and multiplying these numbers. If you have a great many low spots, add the approximate square footage of the low areas to your square footage measurement. Buy 2 cubic yards of topsoil for every 648 square feet of grass. This will enable you to lay down 1 inch of topsoil. The topsoil should be fine in texture; grass may not grow through large clumps of soil. Fill the wheelbarrow with topsoil and dump the topsoil onto the lawn. Use the rake to spread the topsoil into a 1-inch-deep layer over the grass. Keeping the topsoil at 1 inch will replenish the soil and still allow the grass to grow through it. Continue adding topsoil to the lawn and spreading it until you have added a 1-inch layer to the entire lawn. Repeat steps two through five the following year to finish top dressing the lawn. Grass seed needs contact with soil to germinate. According to Texas A&M Cooperative Extension, spread at least 4 inches of topsoil in areas you plan to seed (6 to 8 inches is ideal). If there are low-lying spots or dips, use the soil to level the area. Once the seeds are sown, rake them until they are covered with 1/4 to 1/8 inch of topsoil. Use topsoil on top of an existing lawn to plant new grass seed. Spread fertilizer first, followed by 2 inches of soil. Rake and level the new topsoil, then sprinkle grass seed on top of it. Weeds can invade a newly planted lawn. Use quality topsoil that is made from heated compost. The heating process kills most weed seeds. Four cubic yards of topsoil in theory measures 3 feet tall by 6 feet wide and 6 feet deep. Depending on the delivery vehicle's bed size, the final shape and size of this volume of soil becomes cone-like but spreading. 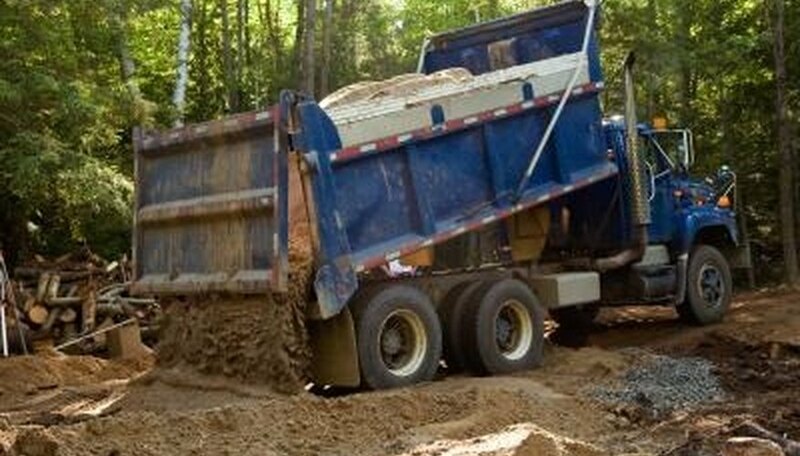 A narrow dump truck bed leaves a different pile than a wider bed. The delivery truck of soil doesn't perfectly dump the 4 yards of soil into a neat pile. Often, to jostle the soil from the truck bed, the driver moves forward with the bed elevated. The truck might also be delivering 4 1/2 yards, not an exact 4 yards. Provide a large area to receive the delivery truck and soil. Access makes delivery run smoothly. Navigating a tight corridor limits use of the hydraulic bed lift. Choose an area in your yard or garden bed in which you will be maintaining plants. Obtain an adequate amount of commercial topsoil for the dimensions of the area in your garden. For an 8-foot by 5-foot plot of land, 40 lbs. of topsoil is adequate. Turn the surface of your garden with a power or manual garden tiller. Scatter equal amounts of peat moss, kitchen compost and live earthworms with castings over the freshly tilled garden earth. Five pounds each of the materials make for adequate enrichments for an 8-foot by 5-foot garden area. Scatter the commercial topsoil on top of the enriched garden soil. Drag the rake over the topsoil, throughout the entire garden, slightly mixing the compost, peat moss and worms with it. Spray the surface of the garden area with a garden hose, thoroughly soaking the soil until it turns black. Puddles of water may form, but that is OK. About 20 gallons of water will flood and mix the topsoil of an 8-foot by 5-foot area. Wait about three days before sowing seeds into the ground, allowing the excess moisture to evaporate. Soil is the rocky base that has been pulverized and pushed upward to the planet’s surface over time. Topsoil is the most finely ground top layer and contains organic matter from decaying surface life. Sandy soil holds few nutrients—it needs some silt and clay to help. Soil with too much clay holds too much water and becomes soggy—it needs sand and silt to hold oxygen and nitrogen between particles to allow proper drainage. A balance of from 40 to 65 percent sand, 25 to 60 percent silt and 5 to 20 percent clay makes a “friable” soil base for a garden or lawn base. Topsoil contains the remnants of millions of years’ worth of dead plants and other decayed matter. They add carbon, oxygen, nitrogen and other nutrients to the minerals from the original rocks. Lime, sulfur, composts and fertilizers containing nitrogen, phosphorous and potassium are used to correct acidity, texture or fertility of topsoil. The term "topsoil" is used loosely. Genuine topsoil is the naturally occurring product of centuries of decomposition and geologic phenomena. It's a rich medium treasured by farmers and gardeners. Genuine topsoil is in short supply, so manufacturers create topsoil products composed of some of the elements of natural topsoil. Earthgro's Topsoil is for general use, such as filling holes, revising low areas in lawns and improving soil composition. It is not recommended for potting, as those soils are formulated to assist with moisture control and drainage. The ideal source for topsoil is Mother Earth, but few urban gardeners are blessed with her finest soil. Gardeners can improve clay soil with compost, peat and gypsum, or sandy soil with compost, peat and forest products. If managing the environment responsibly is a concern, avoid products containing peat. Peat develops slowly from decomposing plant material over centuries. Mining peat depletes the earth's supply and destroys natural habitats. Topsoil is the top layer of soil that holds nutrients and organic material. Because of the various types of soils and different amendments to soils over the years, topsoil at one place may be very different than another brand or one sold at another location. A good-quality topsoil will hold and add nutrients that in turn feed and nourish your lawn. The rich organic material in good topsoil may be from compost or other natural materials that were added to the topsoil over the years before it was claimed. Topsoil may contain traces of herbicides, chemicals or other harmful materials depending on where it came from. Know where the topsoil came from prior to purchase. For lawns, topsoil should have a pH of between 5.5 and 7.5. It should be loam or sandy loam, not clay or extremely sandy. Purchase topsoil that has been screened; screening removes rocks, roots and other materials. Topsoil is rock that has been broken down by the earth’s geological processes and pushed up to the surface where it mixes with decaying plant and animal matter. Humus and nitrogen in topsoil provide nutrition for plants and provide filtration media for water in aquifers. Topsoil varies from about 2 to 10 inches deep. High levels of organic matter give it a darker color than sub-soils and it contains fewer salts, less clay and other materials that might limit plant growth. It has few fragments of coarse rock and contains nitrogen, phosphorus, potassium and iron. Good topsoil allows water to drain easily, but it holds water long enough for roots to use it. Unlike clay or rocky sub-soils, its texture allows easy penetration by plant roots. Ideal topsoil has a pH between 5.5 and 7.5, contains high percentages of sand and silt, a low percentage of clay and 2 percent or more organic matter. Topsoil lost during development excavation or removed by flooding and erosion must be replaced for soil to support plant growth. Topsoil should always be tested before adding amendments or fertilizers. Topsoil can be used for flowerbeds and vegetable garden beds, as well as for laying turf. There are different varieties of topsoil depending on the intended use. Rip any quantity of old newspapers into strips, or run them through a paper shredder. Smaller pieces decompose faster. Dig a hole in your back yard, 1 to 2 feet deep and 1 to 2 feet wide. Cover the bottom of the hole, up to 4 inches deep, with newspaper and lightly spray it with water. Add a layer of grass clippings and/or kitchen scraps to the top of your newspaper. This will hasten the newspaper's decomposition and provide an environment that bacteria, earthworms and microbes enjoy. Cover the food and yard waste with a layer of organic garden soil. If there's room in the hole for another set of layers, just be sure that you keep layering in the same order: newspaper, followed by grass clippings and/or kitchen waste, then garden soil. Leave the newspaper compost untouched for three months. After this you can sift the matter into a wheelbarrow for distribution in your garden. What Is the Organic Material Formed in Soil From the Decayed Remains of Plants & Animals? What Can Make Leaves & Grass Clippings Decompose Faster?